Welcome to the first day of Neat and Tangled's February release week! Today, we're showing off Mail Background, a 6x6 red rubber cling background stamp. This is a new type of product for Neat and Tangled, and we're hoping you'll love it! I couldn't help but pair the letter background and that snail mail sentiment with the sloooooowest critters around - they've been in my digi shop for awhile, but I'm excited to bring them over to the land of physical stamps. I stamped the background and simply colored each heart in red. What a quick and easy job! I then cut out the middle to make room for the sloth+turtle. The sloth usually holds a little flag, but I cut that out and gave him an envelope to hold instead. This is part of the Love Mail die set, also part of the new release. I used another new set for the sentiment, Typed Sentiments. You'll love that one, I promise. This sentiment works so perfectly with the envelope background, and I heat-embossed it onto black cardstock to really make it pop. I hope you like it! Don't forget to leave me a comment before you go! Danielle will pick a winning comment from among the design team's blog posts this week - you could win a $25 gift card to the NT store. And check out what everyone else made on the Neat and Tangled blog this morning - click! that is so darn cute. Cute critters, these look so happy to be delivering love letters together, great colour work. Thank you for sharing. Sweet card! 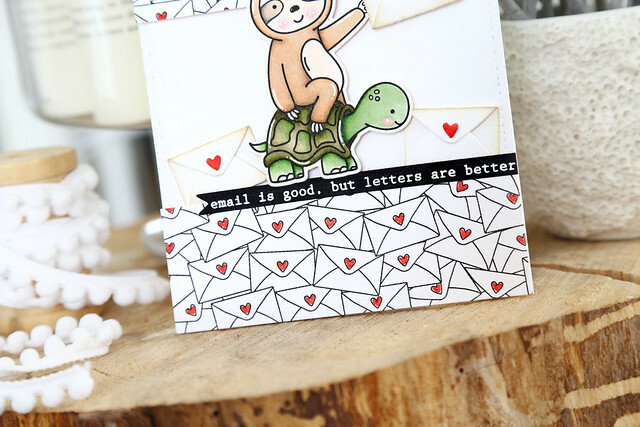 Love the background stamp with all the envelopes, and your adorable sloth and turtle! So cute with the little envelopes! How cute and perfect sentiment for the sloth and turtle. Such a cute card! I love the turtle and sloth with the black and white background stamp! How cute, the two little friends! Can't wait to see what's next! Awww!!! Your card is totally cute!!! I love the idea of using the sloth and turtle for a snail mail card! So cute! So adorable. Love the sloth riding the turtle! Perfect with snail mail background! I love how you combine these two cute slow friends and made them deliver a bit of love on the card. very fun design. This card!!! LOVE!!! What's that sloth saying? "Wheeee!" He's never moved so fast in his life! lol!!! This was the card I chose to repost on FB and IG... love it!! I love everything about this adorable card! The fun sloth and turtle to the great mail background. Eeeek!!! This is so adorable!! And these cute (if slow) critters are the perfect match for the sentiment!